Miniature art is fascinating. It’s intimate and personal. And full of unexpected surprises. Unlike large artworks which require a viewer to step back, miniature art can only be viewed by getting closer and paying undisputed attention to its tiny, perfect details. And only after a viewer has committed herself entirely to the pleasure of a miniature artwork does it reveal it’s astonishing and unparalleled beauty – square inch by square inch. Artists typically spend months and sometimes years to create a high-quality miniature work. They also cannot afford to make any mistakes – there is simply no space to fix or hide it. On the other hand, viewer too has to undertake her own journey, go deeper and open her mind to a world of flowing, rhythmical lines and enjoy the sophistication of artist’s subtle details. Welcome to the spell-binding world of Miniature Art! Painted on a sheet, slightly smaller than A4 size artist Dalchand has created a rich and complex depiction of a scene from a lesser known tragic love story in Rajput mythology. A handsome man who’s exiled from his kingdom by an unjust king is madly in love with the Princess who loves him back equally. But their love neither has King’s blessings nor fortitude. Due to some misunderstanding the Princess kills herself thinking the young man is dead, and he kills himself once he discovers that she’s dead. The subject of the artwork is a scene from the early part of their love story. The young man, who is in exile, takes on the avatar of a wandering yogi in order to visit his lady-love at the palace without the risk of being caught. However, the woman he loves turns out to be the Princess (and daughter of the unjust king) instead of one of her ladies as he thought his lover to be. This discovery leads to such anguish and melancholy that he faints. Shocked and miserable, the Princess too helpless but bound to her throne by her Royal status. Well now that we know the story, let’s look at this artwork. Princess is trying to hide her shock with her hand. From her body language you can tell that she’s resisting her heart’s desire to reach out to her lover. Her Ladies are watching her with concern – and some suspicion, may be? The young man dressed like a yogi has fallen listlessly. Even in this state, his despair and hopelessness is obvious. Some of the ladies have rushed to help him and others are busy gossiping. Examine further to notice painted flowers on the Veena (music instrument), his luminous Pearl earring. The ensemble of various ladies surrounding him – the translucency of their dupattas and the details of their jewellery. If you scroll back to the above images, you will keep finding more and more details – patterns on the canopies and palace walls, vibrancy and intricate pattern of every character’s clothes..
What else do you see? Isn’t it a bit like going down the rabbit hole and finding the magical wonderland? In the last two decades, Indian Miniature Paintings have started to appear more and more on the Auction circuit worldwide as buyers – both of Indian origin and foreigners – have started to collect this unique genre of art with significant fervor. Part of the reason is that high-quality miniature works are rare to find (most collectors don’t like to part with them) and their antiquity value adds to their collectible status. In a Sotheby’s Sale of Miniature Artwork Collection in October, 2015 (London) this outstanding miniature artwork of an outstanding Deccani painting of A Prince Holding a Falcon and Galloping through a Rocky Landscape, from 1680-1700, achieved a price of £329,000 (approx 2.79 crores) – five times the pre-sale estimate. An assembly of Hindu gods, ascetics and worshipers, Hyderabad or Bidar, early 18th century, which sold for £203,000 (Approx 1.72 crores) at Sotheby’s Auction of Sven Gahlin Collection in October 2015, London. On a related note, this auction comprising of 157 lots realized over £4.5m in total, against an original estimate of £1.9m, selling over 90% of the lots on offer. Buyers came from the USA, Europe, Middle East, India and East Asia, comprising collectors, institutions and new bidders. The 400 year old masterpiece and subject of the first half of this post was auctioned two years ago by Pundole’s Auctions in Mumbai, and fetched Rs 1.6 crores. 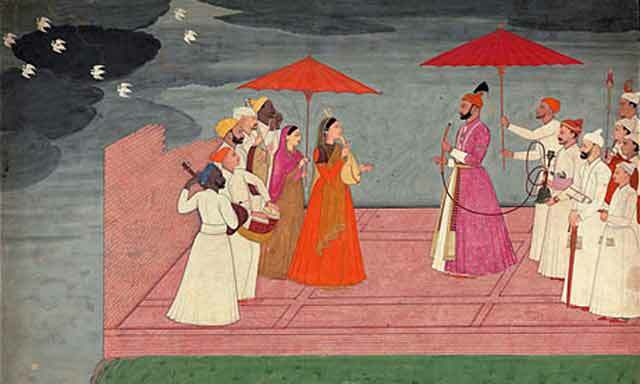 In a strange rags to riches kind of story, a large Indian miniature painting, originally bought by the vendor at a car boot sale for just £40, exceeded all expectations to sell for a final staggering price of £92,250 at a Rosebery’s auction in London. In a world obsessed with everything that’s bigger, better, faster, more – the intricate pleasure of a miniature painting is the exact opposite of the instant gratification and shrinking attention span (3 seconds, I’m told) of our modern world. And yet the sale prices of these tiny parcels of wonderment keeps growing in high-end art circles – whether it be auctions or top-of-the-line art dealers. Counter-intuitive wouldn’t you say? Perhaps it’s an unspoken testimonial of our society’s need to catch its breath, cherish refined moments & re-discover the bliss of slow life. Or maybe it is because we know that with every generation our weapons get better and our artisans weaker. On a brighter note it’s wonderful to note that the better many collectors have become custodians of Miniature Indian Paintings and these small wonders will continue to remain cherished and safe in our modern world. Next Next post: The world’s 15 oldest tea rooms: which one’s your cup of tea?